I’ve talked about some of Sam Peckinapah’s work before with my reviews of The Wild Bunch (1968) and Straw Dogs (1971), both of which I held in very high regard. 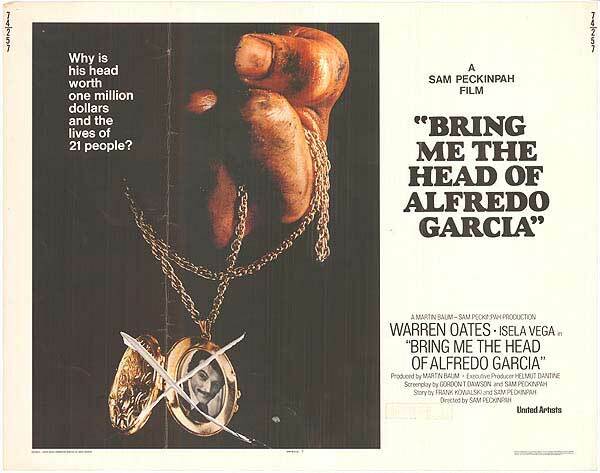 In 1974, Bring Me the Head of Alfredo Garcia was released to very bad critical reviews, despite Peckinpah saying it was his only movie that came out exactly as he had envisioned it. Over time, however, this film has gained a cult status and is received much better than it was when it was first released. Watching this movie, I really felt like this was “Bloody” Sam’s most personal work, and despite feeling a little mixed while I was viewing it, I have come to respect it much more after giving it some thought. After the daughter of Mexican crime boss El Jefe (Emilio Fernández) admits to being pregnant, a hit is placed on the man responsible, Alfredo Garcia, with El Jefe demanding his head. After a two month search, two hit men (Robert Webber and Gig Young) find themselves in Mexico City where they enlist the service of a bar manager named Bennie (Warren Oates). The two hit men offer Bennie $10,000 to track down Garcia and bring them his head as proof of his death. When Bennie’s girlfriend Elita (Isela Vega), a prostitute at a seedy bordello, tells Bennie that Garcia is already dead, Bennie and Elita begin a road trip to his grave to simply retrieve his head for that huge sum of cash. Unfortunately for Bennie and Elita, this simple job is turned into a nightmare of mayhem and mass murder. What’s strange about this movie is that it’s advertised and categorized as an action movie, and I can’t say that’s very accurate. There isn’t a whole lot of violence in this movie, but when there is it’s really intense. There’s Peckinpah’s traditional use of slow motion to really accentuate the carnage that is happening onscreen to both the perpetrators and the unfortunate people who aren’t even involved. That’s all well and good, and definitely provides a lot of bloody fun entertainment, but the real interesting stuff happens between Oates’ and Vega’s characters and also the moral journey that Bennie goes through over the course of the movie. Some of the best scenes are of Bennie trying to explain to himself why all of this is actually worth it and justifiable. The setting of this movie is just as important as any character, and whether that was intentional or not, it strengthens the movie as a whole. We spend a lot of time driving through the Mexican country or through the desert into all sorts of towns. One town might be bustling with activity while the other may be almost desolate. The locations are truly a character all their own. 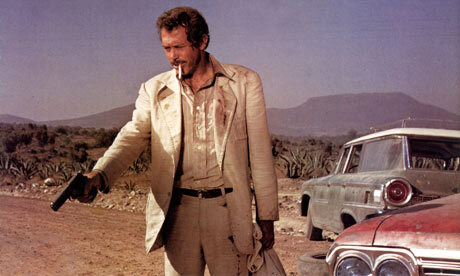 Speaking of characters, props has to be given to Warren Oates for supporting this movie on his outstanding performance. Basing his characters voice and movements off Sam Peckinpah himself, Oates has created one of the most memorable and sympathetic antiheroes to come out of film history. You really have to go into this movie without expecting it to be anything like Straw Dogs or The Wild Bunch. It is significantly tamer than The Wild Bunch and doesn’t offer as much suspense as Straw Dogs. However, Bring Me the Head of Alfredo Garcia offers really intriguing personal drama and moral questions which the other two aforementioned movies only hint at. Instead, these themes are the show case to this film and it would’ve been a much more boring and empty film if they weren’t there to make you think. Bring Me the Head of Alfredo Garcia may not be the best of Sam Peckinpah’s career, but it definitely is the most personal. Mixing brutal action with sincere and heartfelt drama, this film is one to really examine and think about. There is nothing vapid or unnecessary about this movie, and even though I went into it expecting and wanting a crazy action film from the 1970s, I was pleased to see a much more intelligent and honest piece of work amongst the mayhem that is thrown in. As an aspiring screenwriter, seeing films with many different characters with their own complex stories is a bit of a wonder, especially when it’s done well. Seeing these multiple characters’ story lines intersect and affect one another is almost an overwhelming experience out of the seer difficulty of it. This type of story line are seen in Guy Ritchie’s Lock, Stock, and Two Smoking Barrels and David Cronenberg’s Crash, but the grandest example of this comes from Paul Thomas Anderson’s epic drama Magnolia. This is a beautiful, devastating, and often funny in a down to earth way that forces you to connect on some level to at least one or two characters. On a rainy day in the San Fernando Valley, the lives of seemingly unrelated people intertwine and connect in ways that may seem simple, but has the potential to be life changing. Producer Earl Partridge (Jason Robards) is dying of cancer, and his wife Linda (Julianne Moore) can only cope with the death and her own moral insecurities through the use of prescription drugs. Earl’s nurse Phil (Philip Seymour Hoffman) goes on an investigation to find Earl’s lost son Frank Mackey (Tom Cruise), a self-centered sexual guru who wants to stay far away from his family. Jim Kurring (John C. Riley) is a lonely police officer who finds hope Claudia (Melora Walters), the cocaine addicted daughter of Jimmy Gator (Phillip Baker Hall), a game show host where Donnie Smith (William H. Macy) won thousands of dollars on as a child. These lives all collide over the course of a very long day with hopes of salvation. Clocking in at over three hours long, it would be easy to lose interest in this movie if it wasn’t in the more than capable hands of Paul Thomas Anderson. There are a handful of directors working in film now that can handle the task of making a three hour film interesting for its entirety. I would love to see the screenplay to Magnolia and see how Anderson structured it, because this movie is huge and small at the same time. While you can call this movie epic, I don’t find that this is entirely appropriate because the stories are told on a microcosmic level. Magnolia is a very human film that deals with topics that can be deemed as “mystical” like love and death, but they are all dealt with on a very human level. I can’t rave about the writing without also raving about the performances by this stellar mega cast that may be one of the best in film history. Tom Cruise won the Golden Globe and was nominated for an Academy Award for his performance, and rightfully so. His character goes through the most visible change and the range that is needed for this character is huge, and he pulls it off very well. 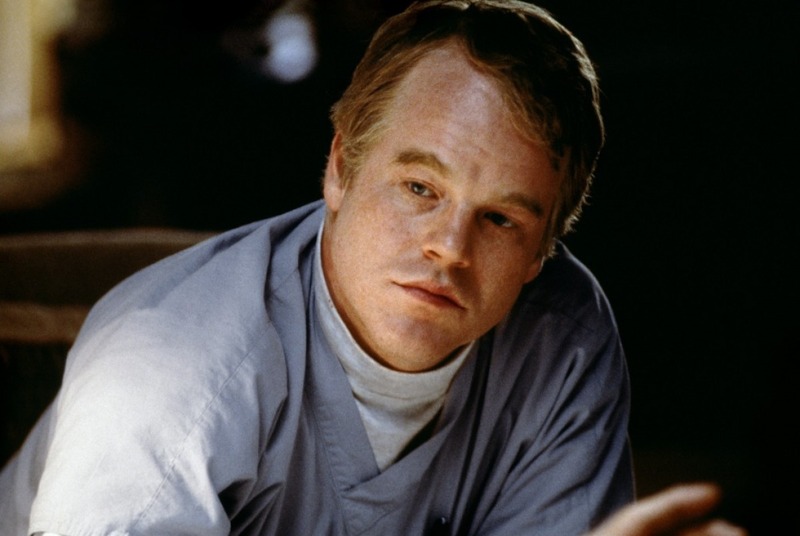 The late, great Philip Seymour Hoffman gives a very understated and realistic performance which made me realize once again the great talent that the acting world has lost. My personal favorite performances in the movie are given by John C. Riley and William H. Macy, both who give borderline tragic performances and probably the most personable to the average human being. Paul Thomas Anderson’s movies are really beautiful to look at, but it isn’t always easy to say why they are so beautiful. There Will Be Blood has a very open and occasionally dirty visual style and The Master plays with depth of field and distorts the viewer’s point of view. Magnolia, much like its themes, is beautiful on a much smaller level. There are some excellent scenes where instead of cutting up dialogue or traveling, Anderson decides to just keep the camera running which almost made me forget I was watching a movie at times. 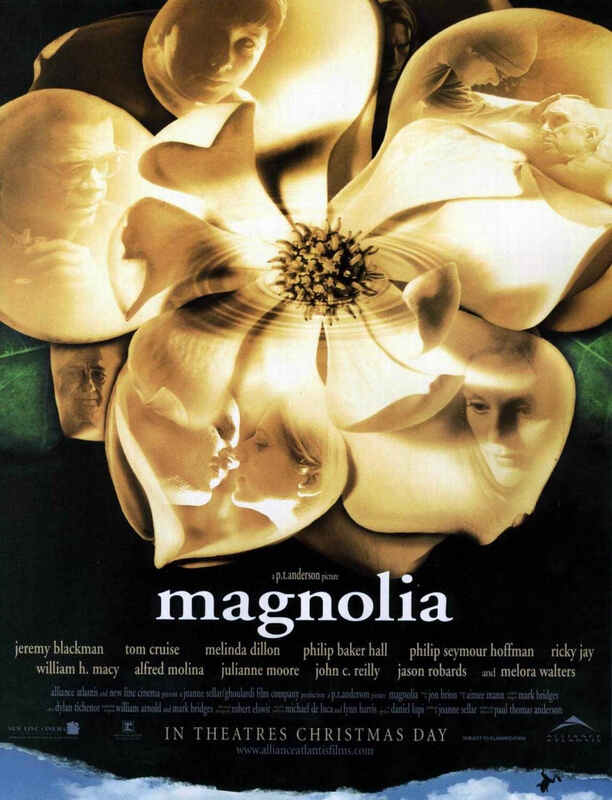 Paul Thomas Anderson has created a wonderful piece of cinematic beauty with Magnolia. Everything about this movie is wonderfully executed from the pitch perfect, complex screenplay, unflashy directing, and incredible acting. While the climax of this movie creates some dissension amongst audiences, you can’t deny that this is a movie that makes you think about your own beliefs and your own ways of dealing with the big problems in your life. Problems that are actually very small in the grand scheme of things. Problems that don’t just affect you. Shane Carruth struck gold with his 2004 indie hit Primer. This was an incredibly original and intelligent science fiction film that touched on the topic of time travel in a way that I never saw before. After years of not making another film, Carruth launched himself back on the indie film scene with another head trip in 2013, Upstream Color. Take everything you knew about Primer and forget all about it. Upstream Color is a genre all its own, and despite a bigger budget and more sophisticated equipment, Carruth’s own pretensions get in the way of what could’ve been a huge step up. Kris (Amy Seimetz) is successful and hard working, but all of that goes out the window when she is tasered in a nightclub by the Thief (Thiago Martins). The Thief infects her body with a sort of round worm which causes her to go into a deep hypnotic state, and forces her into liquidating her equity and signing all of her money over to him. After the worms are taken out of her and transferred to pigs by the Sampler (Andrew Sensenig), she awakens with no memory of what just happened to her. Kris soon meets Jeff (Shane Carruth), a businessman who seems to have some of the same odd experiences that Kris has had, but no memory. Together, as they draw closer together in their relationship, they begin to piece together what happened them, but also try to fix whatever they can of their lives. Upstream Color has a really awesome and complicated plot that obviously has a lot of imagination and intelligence put into it. It’s been established already that Carruth is brilliant. This film shows his intelligence yet again, but it seems like Carruth wants to prove to the world just how smart he really is. It gets to the point in the plot that too much is trying to be fit into one movie and there are plot elements that are established and then forgotten about. Whereas Primer has a very well thought out and deliberately complicated plot, Upstream Color starts really interesting and unique, but it loses steam as the plot goes on and Carruth’s head gets bigger. I do have to give Carruth credit, though, for constructing a plot as unusual as this and using as little dialogue as possible to actually tell the story. Upstream Color is a very quiet movie. Something this film never loses track of is beautiful cinematography which is kept at a constant the entire time. The film is shot crisply on digital and that really is the only way it could’ve been shot. The almost synthetic perfection of the digital images works really well with the story and works to either create an eerie atmosphere or one of complete beauty. There are also some excellent macro cinematography of the round worms crawling through a person’s body or the microorganisms escaping from a pig and into orchids, the latter implementing a creative use of the color blue. I think I know what this movie was trying to say. The strongest theme that I could see coming from the plot is the overcoming of an addiction, whatever that may be. In Upstream Color, the characters don’t remember the traumatic event that happened to them, but they still behave in a way where they need each other’s help to rebuild their lives because of a foreign invader that chemically changed their bodies. This is one of the most fun parts of this movie, trying to figure out what all of the imagery and allegories mean. It really does demand a second viewing with a mind that already knows what it’s getting itself into. Upstream Color is sort of a mixed bag for me. I really loved the story and the execution of said story with as little dialogue as possible. It’s also beautifully shot on digital to the point where it’s hard to look away. Unfortunately, Carruth knew that he was making a good movie and it seemed to have gotten to his head in a way that Primer never did. 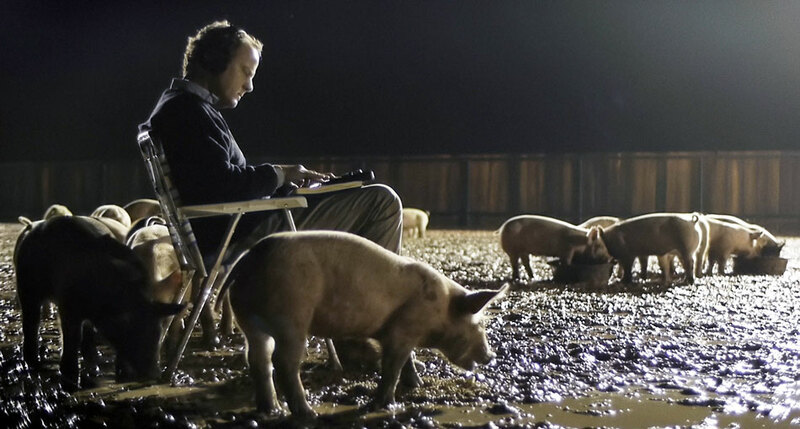 Unfortunately, these pretensions make Upstream Color lose itself a bit towards the middle of the movie, bogging itself down in unnecessary images and plot points that are never again explored. Still, this movie is just interesting enough to try, and even if you don’t like it, you’d still have a strange movie to talk about with your friends. In the 1960s, Hollywood was undergoing a major change. From the 1930s up until the late 1950s/early 1960s, movies were strictly regulated in terms of their content. A new Hollywood was now forming and the regulations were not so strong. 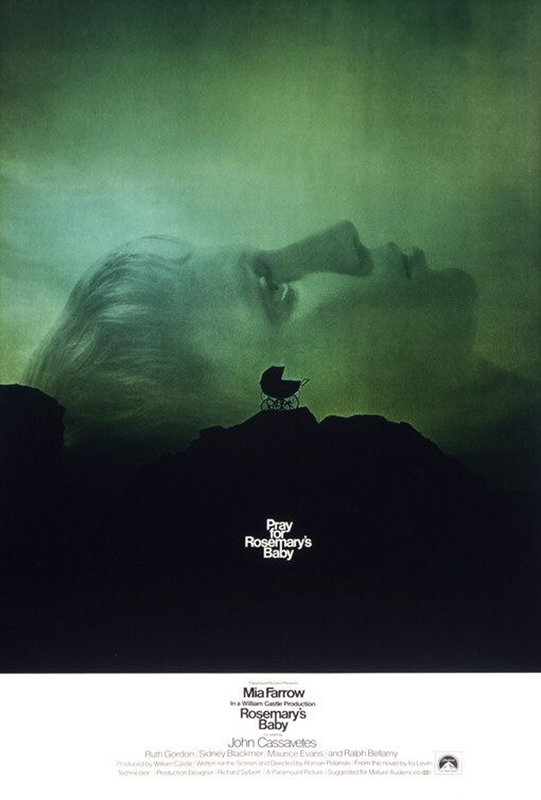 Enter Roman Polanski’s horror masterpiece Rosemary’s Baby, a deep exploration of psychological dread mixed with dark occultist magic. It’s an excellent combination that is executed perfectly, and couldn’t have been made under the much more strict guidelines of classic Hollywood. Rosemary (Mia Farrow) and Guy (John Cassavetes) are a young married couple in search of a new place to live. They finally find comfort in the Bramford, an old New York City apartment building with a strange, dark history. Rosemary and Guy soon become friends with the elderly couple living next door, Minnie (Ruth Gordon) and Roman (Sidney Blackmer), who are both eccentric and incredibly friendly. When Rosemary learns that she is pregnant, Minnie and Roman seem very excited, but Guy never really wants to think about it. As time goes on, and the due date for the baby becomes closer and closer, Rosemary begins to become paranoid about everyone around her while dealing with incredible pain from her abdomen and strange concoctions given to her by Minnie and Roman, whom Rosemary now believes are witches. All of this may be a deeply Satanic plot or just a deeply personal problem for Rosemary. Much like Polanski’s earlier work, Repulsion, this film puts horror in the worst place you could ever have it. In the comfort of your own home. I have place set aside in my heart for films that bring the horror to you, in a sense, like the first Paranormal Activity and The Strangers. What Rosemary’s Baby does differently than these movies is add the plot point of an unborn child into the mix to create some deeply rooted chances to explore psychological dysfunction, but I’ll talk more about that later. Rosemary is never really safe in this movie, and that’s part of where the paranoia and the fear comes from, but Polanski makes sure that this never gets out of hand. What makes this film so successful is Polanski’s deft maneuvering of a plot that at times appears to be stuck in the mud, but is never really stopping. The pacing is slow and makes the audience wait a long time to really understand what is actually going on. That combined with the fact that even we don’t full know if Rosemary is in the right state of mind or if this is actually all a big occult plot against her. We spend a good deal of the movie questioning what’s going on around Rosemary and try to piece together all of the evidence that makes sense and the rest that doesn’t make sense. It’s a great way to construct a plot. So the style and the plot are both really good, and the final thing that makes Rosemary’s Baby the horror classic that it is are the performances. Mia Farrow begins as an innocent housewife into a woman who is completely in shambles, both mentally and physically. John Cassavetes brings his traditional realistic, and almost improvisational, acting style which gives his performance a believability that you don’t always get from movies before this time. Finally, Ruth Gordon and Sidney Blackmer are perfect at playing the old people next door, but bring a disquieting element of distrust that makes for exceptional antagonists. This video is from Bravo’s countdown of the 100 Scariest Movie Moments. They perfectly summarize everything that makes Rosemary’s Baby as great as it is. Personally, I believe that Wes Anderson is a genius when it comes to film, although I’m sure many would disagree with me. The way he writes, builds characters, and composes shots are just some of the most brilliant examples of film making as an art that I have ever seen. From Bottle Rocket to Moonrise Kingdom, there has not been one film of Anderson’s that I have disliked. Now there’s The Grand Budapest Hotel, a film that shows Anderson’s growth as a film maker and can and will be labeled as his masterpiece. 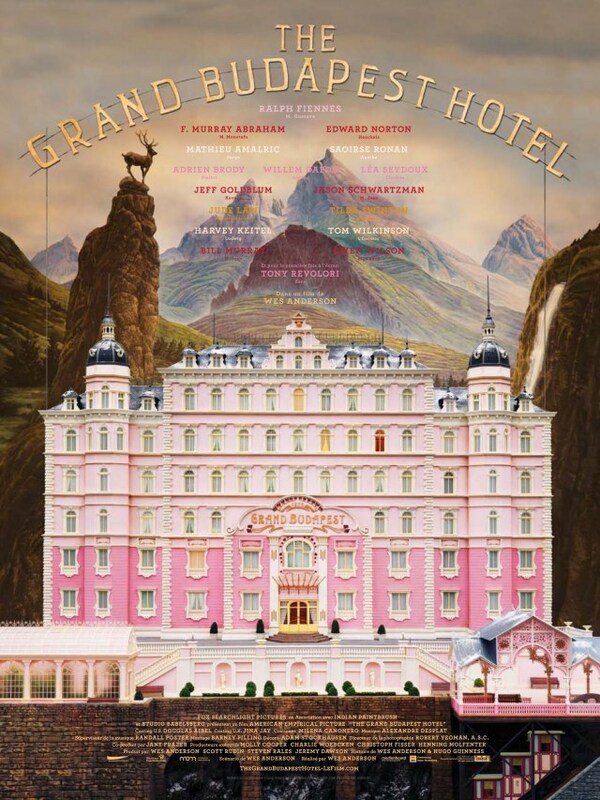 In the fictional European region of Zubrowka lies the Grand Budapest Hotel that is run by the oddball concierge Gustave H. (Ralph Fiennes), who spends most of his free time giving sermons to the employees during dinner and sleeping with the old women who come to the hotel, with a special relationship that forms with Madame D. (Tilda Swinton in some ridiculous makeup). When Madame D. turns up dead, Gustave enlists the help of his new friend and lobby boy Zero Moustafa (Tony Revolori) to go to her estate to hear her will. When it is revealed that an extraordinarily valuable painting is left to him, her son Dmitri (Adrian Brody) and his assassin friend J.G. Jopling (Willem Dafoe) start a quest to reclaim the painting, while Gustave and Zero have to work to clear the concierge’s name after he is accused of Madame D.’s murder. This was one of the most difficult summaries I’ve had to write because so many characters do so many things over the course of the film. This films shows Anderson stepping completely outside his comfort zone and making a much bigger story, all while keeping his trademark visual style. One of the most interesting aspects of The Grand Budapest Hotel are the constant allusions and allegories to the start of Nazism and the early invasions that sparked World War II. Wes Anderson does this in such a way that is humorous in his own quirky way. The Nazis aren’t Nazis (aptly being called the “Zig Zag Party”), but we all know who they really represent. The cast in this movie could be described as remarkable, but that would truly be an understatement. Ralph Fiennes shows true comedic timing that was only briefly seen in his small, villainous role in In Bruges. Now he gets to show it off in it’s full potential. Newcomer Tony Revolori seems to have been made to be in a Wes Anderson film, and I’m excited to see where his career goes. Brody and Dafoe are comically evil and provide some of the funniest scenes in the movie. I could go on and on about this cast, but there isn’t enough time to talk about everyone. 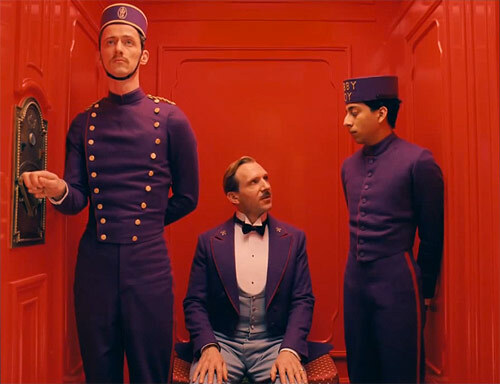 Jude Law, Jason Schwartzman, Owen Wilson, Bill Murray, Harvey Keitel and others all bring their A-game here, and while their roles may be small, they use whatever screen time they have to help make The Grand Budapest Hotel as memorable as it is. How could I not mention how beautiful this movie looks. Every one of Anderson’s movies surprise me somehow. The awesome viewpoint of seeing every room of the boat in The Life Aquatic with Steve Zissou to his stop motion landscapes in The Fantastic Mr. Fox, Anderson has one of the best eyes in modern day film making, and is part of why he really is a genius. The Grand Budapest Hotel shows some of the best examples of his obsessive mise-en-scène. The perfect camera swivels and the blocking of its various different characters in relation to each other makes this one of the most picturesque films I’ve ever seen. Some shots look like they could have come out of a post card or a painting. In the years between 1986 and 1991, 10 murders were committed in the Gyeonggi Province of South Korea, marking the first serial killings in the country’s history. Memories of Murder tells the story of the detectives who were charged with finding the killer and potentially saving more lives. This movie had potential to be a derivative detective film, but the history and consequences is what really brings Memories of Murder from being average, surpassing good, and becoming great. When a young woman is found raped and murdered in October 1986, it seems a little out of the ordinary in such a small and peaceful village as Hwaseong. Detective Park Doo-man (Song Kang-ho) is put on the case, but is soon joined by Detective Seo Tae-yoon (Kim Sang-kyung) from Seoul after it is determined that they might have a serial killer on their hands. With such a danger lurking about the streets, it is imperative that Doo-man and Tae-yoon find the culprit as quickly as possible, but this is made almost impossible with such crude forensic technology. The two detectives are then forced to you their own intuition and, often times, brutality to find the killer and save any potential victims. Memories of Murder is a near perfect detective/crime film. It’s pretty standard now to have a detective or police procedural movie that implements all the different kinds of technology and resources available to find their suspect. This is exactly what this movie is not about. It was so refreshing and startling to see an environment where there are so many hoops to jump through and people to hurt in order to secure what’s best for the common good, especially in a modern era. At times, the policing is brutal and often wrong, but the stress of the detectives comes through very well and makes Memories of Murder all the more effective. In my honest opinion, South Koreans have the best eye for cinematography than any other country. Memories of Murder is visually stunning. It really covers all the bases, with beautiful slow motion shots to excellent uses of color. Sometimes it’s not important if a movie looks great, but other times the better it looks, the more impactful the material is. That’s the case with this film. Some of the most beautiful scenes involve highly desaturated rural landscapes with either a red ribbon or a red coat that draws your eye. This may sound like a cliche, but when done right it look fantastic. Much like with the lack of forensic technology making Memories of Murder unique it its brilliant use of comedy. With a story that tells of South Korea’s first serial killer, you would think that it would be somber and serious at all times. I was expecting that. I was pleased to see that there was some scenes of comedy throughout, both lighthearted and dark. That right there is a sign of an exceptional screenwriter, and I have to give this credit to the writer/director Bong Joon-ho. Joon-ho uses the same kind of comedy mixed with seriousness in his next feature, the phenomenal monster movie The Host. Memories of Murder is an exceptional film that will horrify you, move you, and make you laugh. It tells an interesting tale of detectives doing everything they possibly can to catch a serial killer, even though it seems apparent that their attempts are futile. It’s easy to make an average detective film, but it’s not so easy to make one as memorable as Memories of Murder. Every great director needs to start somewhere, even Danny Boyle. Believe it or not, he wasn’t just always around making movies that make us all go crazy. Danny Boyle has created a lot of masterful pieces of work, and the movie to put him on the map was his 1994 debut Shallow Grave. Now considered to be “a ’90s classic,” I found this movie to be good and entertaining, but I can’t say it was really anything special. For a debut feature film it still is impressive, but plays it way too safe, and Danny Boyle certainly isn’t a director who’s afraid to take chances. Alex (Ewan McGregor), Juliet (Kerry Fox), and David (Christopher Eccleston) are three flatmates and very good friends who are in the process of finding a fourth person to share the place with. They find their man with Hugo (Keith Allen), who ends up dying a few days later of an apparent suicide. Before the police can be called, Alex finds a huge suitcase full of money and convinces the group to use this to their advantage. After disposing of the body, paranoia strikes. Soon, the group of close knit friends can’t even trust each other, and with the police catching their scent and two thugs on a killing spree, their limits are tested and violence soon erupts. Being Boyle’s first feature film, this is a very interesting watch. It’s also the first film for screenwriter John Hodge, producer Andrew Macdonald, and it’s also the first major role for Ewan McGregor. Boyle and the rest of these names would later collaborate again in 1996 on Trainspotting, which I personally believe is Boyle’s masterpiece. Shallow Grave is nowhere near the same level as Trainspotting, but I can appreciate the sort of Hitchcockian/Coen Brothers kind of feel that the characters and the entire plot has. I really did also enjoy the performances in Shallow Grave. Christopher Eccleston has a really cool part in this movie, and has to pretty much play two different characters over the course of the movie. Ewan McGregor, on the other hand, only has to play one role but it seems like he’s having a helluva time with it. He almost literally bursts with energy in every scene he’s in, and I could really tell he was just having a really good time with the character. The dialogue is especially important in this movie as each of the tenants each have their own distinct personalities, and the writing really helps in differentiating them, personality wise. What didn’t really work for me is how safe the screenplay plays it, the lack of style that the movie has as it goes on, and the horrendous soundtrack. Let’s look at these one by one. The screenplay doesn’t really dare going places thrillers like this don’t normally go. I feel like I’ve seen this before, and the only thing that keeps this movie at all interesting are the characters and how they change over the course of the plot. The style and the soundtrack kind of go hand in hand. They both start out awesome with kinetic editing and fast paced techno scoring, but both of these disappear. The style becomes pretty average and the soundtrack, with its overdramatic piano chords, is just horrible. 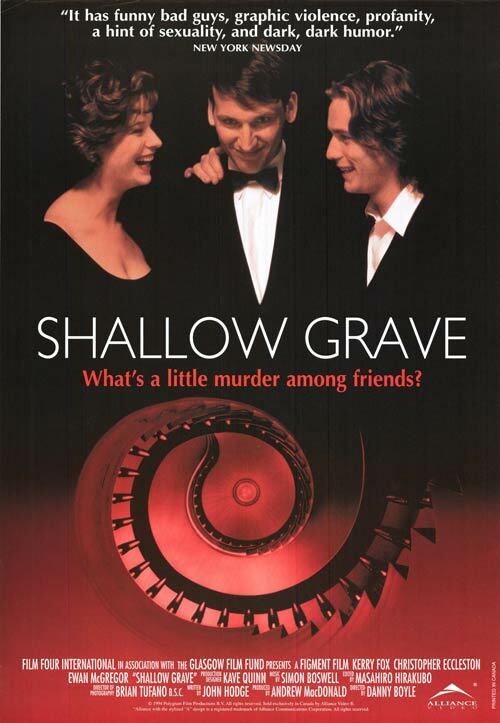 Shallow Grave is a serviceable thriller that doesn’t really lead to anything special. It’s interesting to see because it’s the start of a lot of people’s careers, but it isn’t a movie that you’re bound to remember because of the content. This hearkens back to the days of Hitchcock, but it doesn’t reach the levels that Hitchcock or the Coen Brothers set. 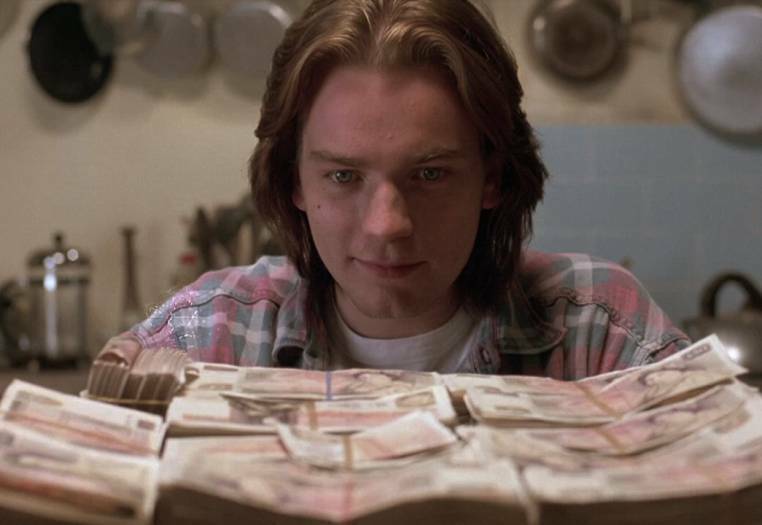 Danny Boyle would go on to become one of the most intimidating forces in the film world, but Shallow Grave is only worth watching if you’re interested in seeing the beginnings of people who are now highly successful.